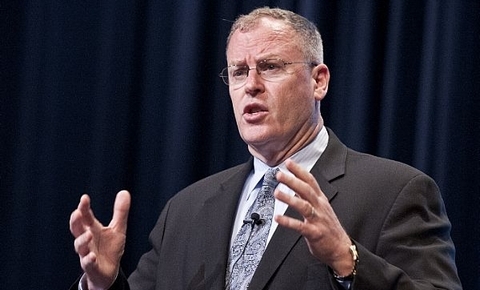 Robert Work, Navy undersecretary, is joining the national defense and security think tank Center for a New American Security as CEO and will start his new position April 22. Work succeeds Nate Fick, who stepped down in November 2012 to become CEO of cybersecurity firm Endgame, the CNAS said Wednesday. During a January Navy symposium, Work told the audience it would be the last time he would address them as undersecretary. As undersecretary, Work serves as deputy and principal assistant to the Navy secretary and as chief operations and management officer of the Department of the Navy, having responsibility for the department’s day-to-day operations and its $170 billion budget. “Bob Work is in the very front ranks of those thinking about and working to strengthen our national security,” said Dr. Richard Danzig, chairman of the CNAS board of directors. Work completed his 27-year Marine Corps career by military assistant and senior aide to Danzig when he served as Navy secretary. Previously, Work served as a senior fellow for maritime affairs and as vice president for strategic studies at the Center for Strategic and Budgetary Assessments, where he focused on defense strategy and programs. He also focused on revolutions, Defense Department transformation and maritime affairs and has written about U.S. Navy and Marine Corps strategies and programs. While at the CSBA, he directed and analyzed wargames for the Pentagon, helped carry out studies on global basing and engaging military missions and supported the 2006 Quadrennial Defense Review. “Bob brings to CNAS his vast substantive expertise on many of the most critical defense issues facing the nation, along with the leadership experience and management acumen gained in running the day-to-day operations of the Department of the Navy,” said Michele Flournoy, former defense policy undersecretary and a CNAS board member.